CreditWise is Capital One's proprietary credit monitoring app, designed to help users not only better understand their credit, but also work towards credit-related financial goals. This page details my UX contributions to a few features in CreditWise. This is a section of the app that can be accessed by tapping on CreditWise's most prominent feature: the score wheel. During research, the team found that users with limited credit experience would tap the score wheel in order to learn more about their score. As such, the primary intent of the About My Score page (ABS) is to educate users with little-to-no experience or understanding of credit about how credit scores work and are calculated. On entering the ABS page, users are met with a few short paragraphs describing the credit system, credit scores, and how they are calculated. 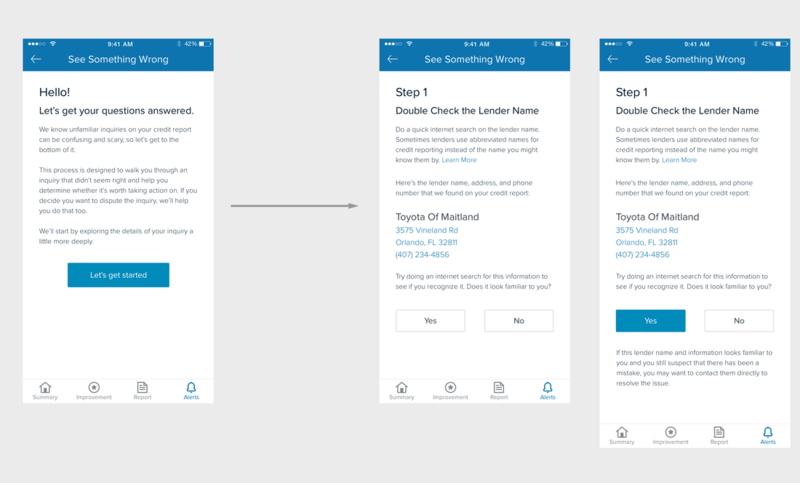 Presenting this information in a way that was easily digestible, but still sufficiently descriptive to build users' understanding of credit, was key. These paragraphs are also broken up with custom illustrated banners, in order to maintain a sense of levity. Because this information can be overwhelming for new users, it was important to make sure they didn't feel alienated by a wall of financial-speak text. One other key aspect of About My Score is the "mini-simulator" at the bottom of the page. This feature allows users to simulate the effects of a key credit decision on their credit score -- in this case, keeping up to date with bills. The purpose of this feature is to contextualize the rest of the information presented in a way that is visually intuitive and refreshing; it was important to offer new users a break from reading at this point. Additionally, the mini-simulator acts as a gateway into CreditWise's full-fledged simulator, a similar feature that offers more robust functionality. In this way, users are simultaneously onboarded to both the credit system and CreditWise itself. Resolution Butler is a feature still in development for CreditWise, designed to help users diagnose and resolve identity theft threats. Although the original MVP version of this feature was a simple list of tasks that users could do in order to resolve their ID theft problem, it was important that a new version be more considerate and thoughtful to the needs of a user who is likely inexperienced, worried, and under high stress. In order to achieve the goal of a more personal and supportive threat resolution experience, I settled on a step-by-step process that gradually shifted from diagnosing a user's potential threat to resolving it as needed. This flow manifested differently depending on the type of identity theft: social security number compromises require different steps to diagnose and resolve compared to email compromises. As such, it was important to take each type of compromise individually and map out the necessary actions that a user could take to address the issue. However, although each type of compromise requires a different approach, it was important that the experience of resolution be consistent across compromise types, not only for the sake of keeping the user's experience consistent but also to keep our development team from needing to create multiple disparate experiences. As such, I designed an interaction flow built around asking the user questions, then directing them to the appropriate resolution resources. By integrating the user into the resolution process, we simultaneously make the process feel more personal while keeping the experience modular.